I have been making gifts and getting some projects prepped for some time off I'm taking next week. 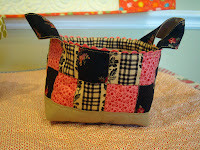 I have made so many of the baskets from the tutorial on Pink Penguin I can hardly keep track of them all. I've really enjoyed making them so much. 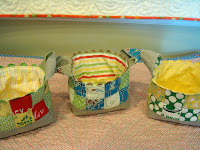 I even changed the size of the squares and made 2 larger baskets. 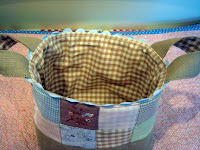 It is such an easy project I highly recommend you try out making the basket for a gift or just for fun. 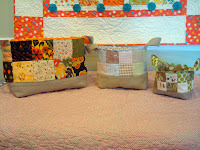 This picture shows the 3 sizes I have made. For the large basket the squares are (cut) 3 1/2", for the middle basket the squares are (cut) 2 1/2" and for the small basket they are (cut) 2". 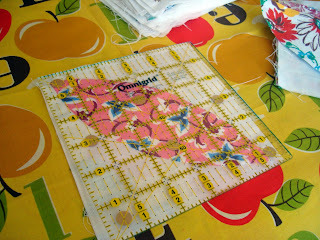 Pink Penguin's original tutorial is the smallest size - 2" squares. I allowed for increase in the linen bottom part of the basket and the lining by measuring the parts of the smaller basket and increasing in proportion to the changes made in the size of the squares. I made this one for fall using pieces from a charm pack I picked up last month. Don't you love charm packs! You get all the flavors of the fabric line for under $10.00 in most cases. 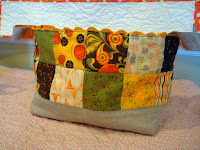 The lining was from my stash - from the Peas and Carrots fabrics of last year. 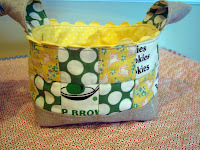 And I added rick rack to the tops of all the baskets like the first one I made. and I lined it with a check from that same line. 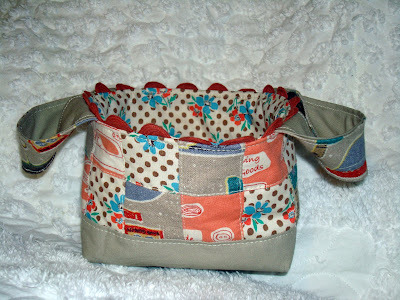 The rest of the bags are scrappy and from my stash using a combination or reproduction fabric and retro Japanese. This one is a kitchen basket. I love the look of clean white chenille and white bed linen. 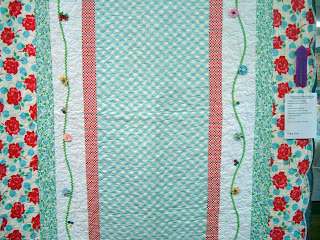 I wanted to make a summer bedspread/comforter in a cool white but with some color added. 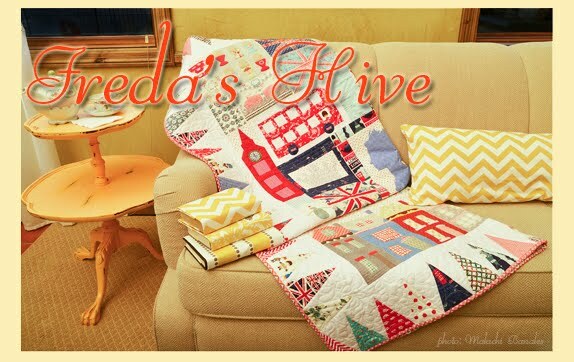 I came up with this idea last winter thinking my old spread needed to be retired and my thicker quilts would not do for summer. 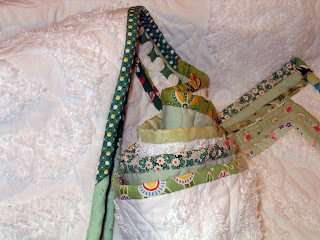 I priced white chenille by the yard and found to make a summer comforter/quilt it would be very pricey. Much of the chenille I found was in the $16.00/yard range. And then I'd still have to piece it. I wasn't really excited about a seam down the middle. I went to Overstock.com and got a white chenille bedspread and 2 pillow shams. I think the spread was around $40.00 on clearance for king size. (They don't have them anymore.) I also bought some pale green sheets in a high thread count on sale. When the bedspread came I cut off the tassles (messy) and trimmed the chenille and sheet so the sheet was slightly bigger. 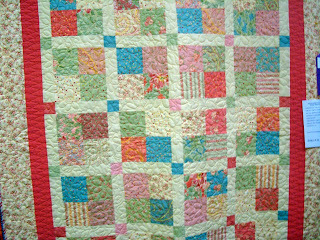 Then I took it to my quilter. 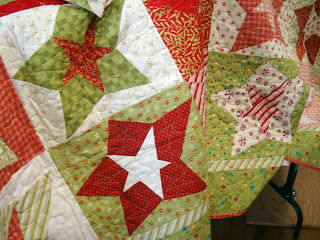 She had it for a while but was so busy I later picked it up and took it to a new quilter, (Wendy in Eagle Mountain) and it was done in a week. 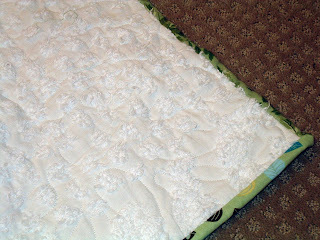 I had a very light-weight batt put in the center of the chenille and sheet. 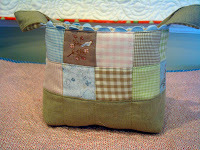 Wendy quilted it in a puddle pattern with white thread so it wouldn't take away from the design of the chenille. I wanted to add a little color to it so I made strips of binding 14" long and sewed them together for a varigated binding. 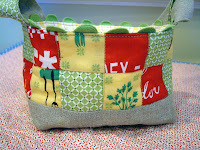 Rashida made some and showed it on her I Heart Linen blog. 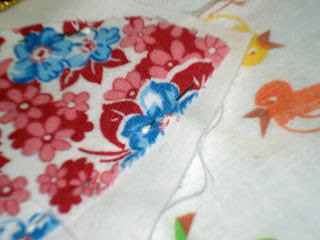 I've made varigated binding before but I usually use longer strips of scrap fabric than Rashida used. If I had it to do over again I'd cut them 6-7" long instead of 14. It would make more diagonal seams in piecing them together but I think it would be more fun to see more fabrics in the binding. Kind of like Rashida's (I don't know how long her strips are). My only requirement in choosing the binding fabrics was - they had to be mostly green so I have lots of different dark and light green values in the binding. Overall I'm pretty happy with it. The size is ok for my king bed and I love the clean white look with the pop of green edges. I had ordered new matching sheets for the bed as well and the high thread count does feel really nice. 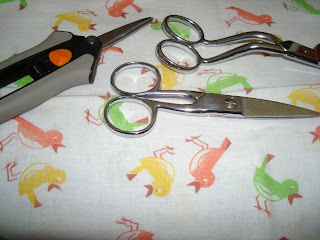 I still want to do what Jona did now and make new pillow cases, even though new cases came with the sheets. 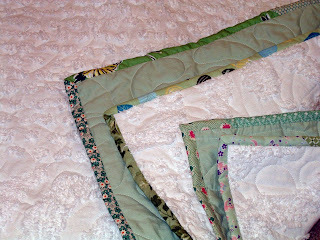 I think a green with a big floral would be a fun addition and Jona's pillow cases turned out so darling - why not try that. 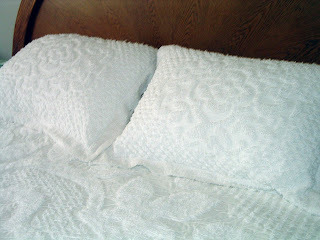 Even though summer is half over, my white chenille spread will be on the bed now at least until we turn the heat on. Then I'll either put it away for next year or add a quilt for warmth. 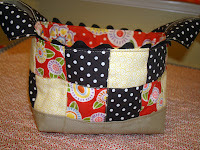 Jodi made a basket and showed it on her blog and she credited Ayumi from Pink Penguin. The baskets are so cute. And Pink Penguin has a TUTORIAL! Don't you love when that happens. 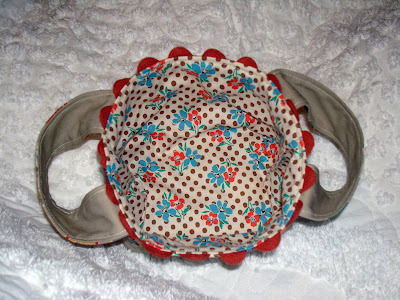 You find something really cute and the instructions are free and easy to make. Over the weekend I cut out 6-7 baskets. 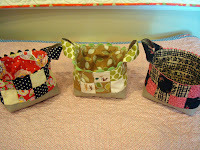 I thought they would make great gifts and be a cute way to hold small things in my home. The baskets are smallish in size by the way. I'm thinking of modifying the idea and making some larger ones. 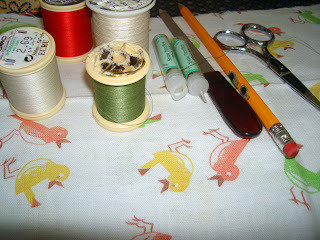 I really had a great time picking out fabric (from my stash!) 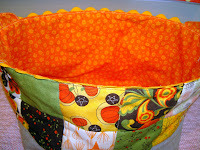 and sewing up the first basket shown here. I made the handles slightly longer and added some rick rack. 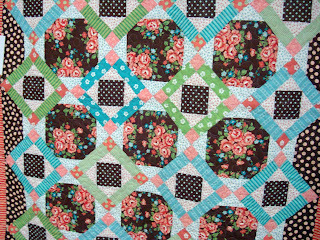 I also opted to machine quilt around some of the squares. I finished my apron I started sewing last week. It has been a while since I have followed a pattern for something more like clothes construction. I had a few things to change/fix. I lowered the ties slightly (actually I unpicked them 4 times but most of that was user error). 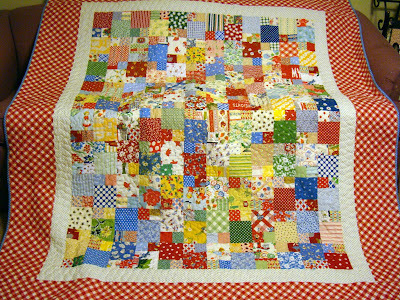 I love Jennifer's Bell Bottom line of fabric and I think the apron turned out bright and cheerful with a hint of vintage. 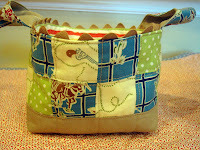 The pattern is from Barbara Brandeburg. 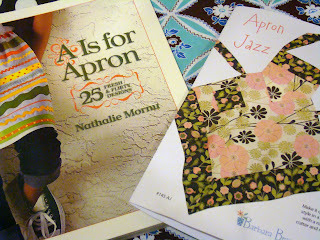 I had planned on making more aprons this week but I don't think I'll have time. I'll stick to the baskets I have cut out and see how much time I have left over. I have really darling yellow and blue fabric for my next apron so I am excited to make another one now that I've conquered this design. 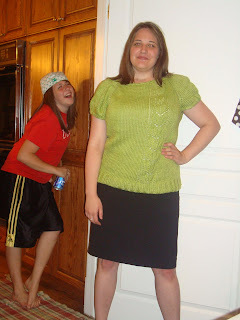 Here is Laurie again, the reluctant model wearing her Phillies' cap and teenager expression. After making my vest - I wanted to make something that would be wearable for the summer. 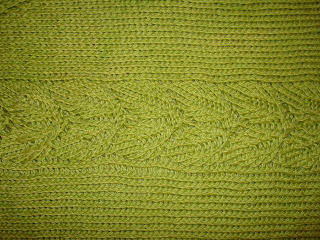 So, I got some cotton/silk blend & decided to make a pattern that has been a favorite of my - and is currently the #1 pattern on Ravelry, the Rusted Root pattern from Zephyr. I went with a heavier weight yarn (worsted), and a smaller size - which worked out well. I'm pleased with the puffiness of the sleeves, and the thickness of the patterns -- this is one of many patterns that was designed for an extra-small, so, by going to a heavier yarn size, I think it helped to make the sweater look more custom-made to my size. 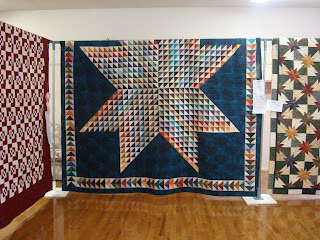 Most of the local towns around where I live have quilt shows during their celebration weeks in the summer time. A couple towns over from me they are having their yearly summer celebration. 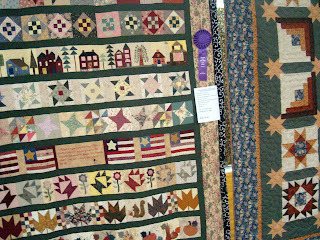 Cathie reminded me that the quilt show in American Fork was today and tomorrow. Thanks Cathie! When I visited the show today Cathie was there manning the sign-in table. 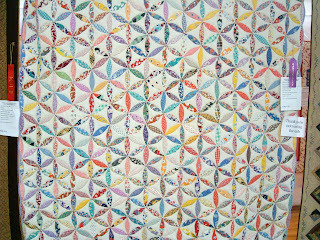 When I got to the quilt show location I realized I had forgotten my camera! But I sent my daughter down later to take a few snap shots. She probably didn't take pictures of the ones I would have but you'll get the idea. 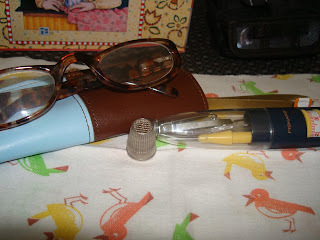 And check out Cathie's blog this weekend for pictures. I made her promise she'd put them up on her blog. As we were walking through the quilts Laurie said to me "Mom, look those are your quilts!" Well not mine, but my patterns. 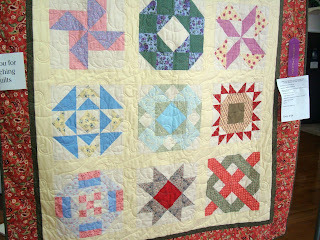 It was really exciting to see my ideas and patterns worked up by a good quilter and put in the show. It was so fun! 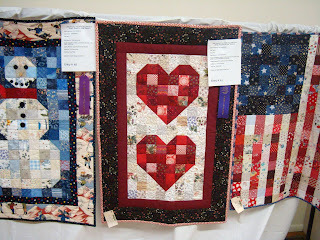 The quilter credited me on in her write-up about her entries. 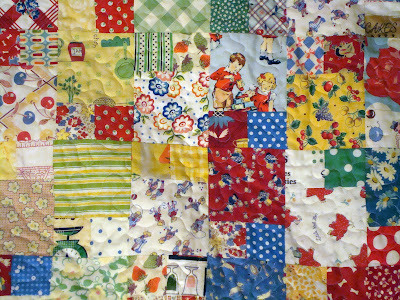 There really were a lot of very nice quilts. And this is just sampling. I was really glad she took a picture of this quilt. It really was my favorite, of course. Its kind of like my Parchessi quilt. 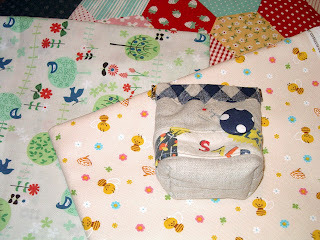 Feedsacks and vintage fabric. So so cute. For the next couple weeks I have mostly smaller projects planned. I should be catching up on Dear Jane blocks first but I want to make some aprons and then try to get to Dear Jane this weekend. I have some really good patterns for aprons that I am excited to use. 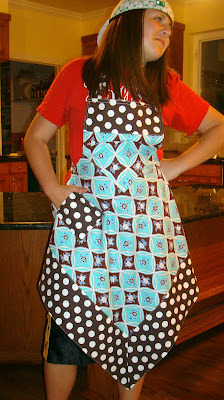 I like the look of half aprons but I think its somewhat impractical for real cooking or sewing (those darn threads). This apron book I got from Flora for my birthday has so many cute ones. The problem is deciding which one to make first. 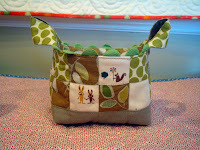 And I have this pattern from Barbara I've wanted to try out. 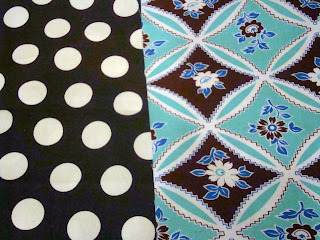 I decided to use this Jennifer Paganelli Bell Bottoms fabric with this brown and white polka dot I picked up a bit ago to make the first apron. 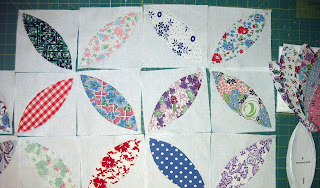 I cut it out last night and we'll see if I can get some of it sewn up today. These were both in my stash by the way. Now July is supposed to be use it up month for me and its going just so so. 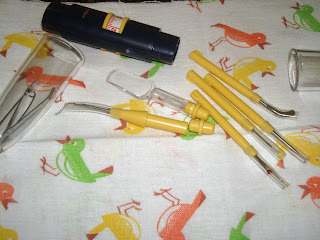 It has certainly made me more aware of purchases, specifically in the sewing/quilting area. Our kids computer bit the dust this month so buying a new Mac for them kind of took the wind out of my no spending sails, plus it was my husband's birthday. Oh well. 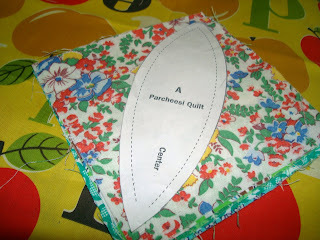 For me, so far, I did make a few purchases of some fabric and a little pouch from I Heart Linen. I have some similar hardware to make some pouches myself and I've been wanting to make them for a while but I haven't figured it out yet. 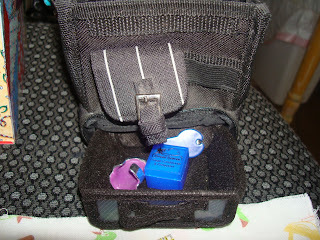 (But I'm certainly not going to copy her item or sell pouches.) 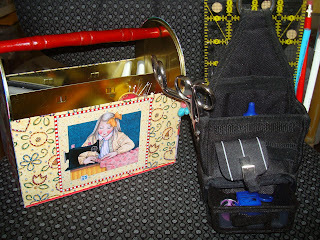 My spring frames are mostly larger but she does such great work that I thought I might learn something from her techniques and in the mean time have a little pouch that I can put my cell phone in, money or anything I want to carry in a mini bag. 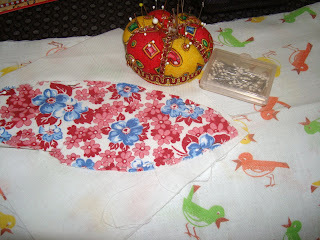 I am going to make a sewing apron for me from the bee fabric and the other 2 fabrics are additions to projects planned. I know they were not NEEDS to be honest here. 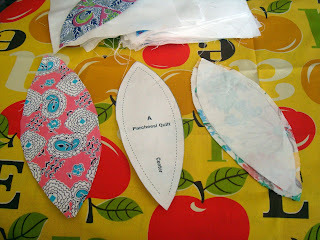 And I did also buy a notion from Quilt Taffy but I'll talk about that another day- really that was a need. 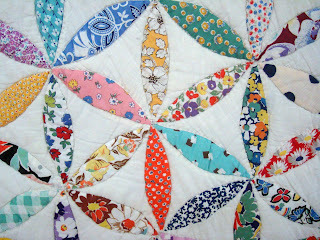 And while we are talking Quilt Taffy, plase go read Des's post today. I second her post with trying to email my readers back. 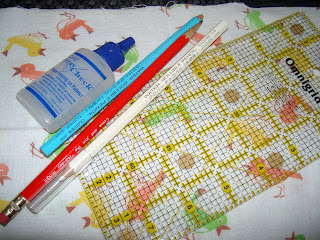 And besides that they are having a drawing for free fabric. So go do it. All in all I give myself a B- for sticking to my goal for July. Hey thats better than an F.